The temperature at 7AM was 45.0F and mostly cloudy. There was a lot of cloud and little real sunshine at the time. There was no wind and as we say back home, it was flat calm. A bit different than yesterday when we had to run out and take in the awnings that were jumping around pretty good in the wind. Joan headed off to the sewing room at 8:30AM. That girl will have that place worn out if we stay here long enough. The sun was out and hot by 9AM with the temperature up to 56.0F and mostly cloudy. The mostly cloudy was a lot of high cirrus as though someone had swished it on with a paint brush. Too bad it did not hang around and form a pretty sunset. Bill and Donna hooked up and left at 09:50AM. They want to visit for a couple of weeks on the way home to Wisconsin. By 10:30AM the temperature was 59.9F under scattered clouds. There was very little wind. The trees did not appear to be moving but Augie and Paula's flag or whatever it is under their hitch was moving a bit. I had all the vents and door open. It was a bit cool but the thermometer read 70F in the trailer. For an hour or more around 10AM several weak high speed stations were chatting away on 14023 kilohertz. At times three or four were transmitting at the same time as though everyone was transmitting and no one receiving. One station was a W1 over in the northeast someplace. They may have all been in that area. It would have been hard to hear a Nova Scotia VE1 for sure. At 11:30AM it was 64.0F and partly cloudy. We could see no clouds at all out the trailer windows. I gave a long fast CQ call and then a slower call on 14023 kilohertz at 11:30AM. If anyone answered me I sure did not hear them. At 12:30PM the temperature was 67.2F and partly cloudy although we could see no cloud from the trailer. A beautiful sunny day with a cool breeze. Joan came home around 12:30PM with these photographs of the girls and their quilts. Those of you who are interested be sure and double click your left mouse button and bring them up where you can see the threads. 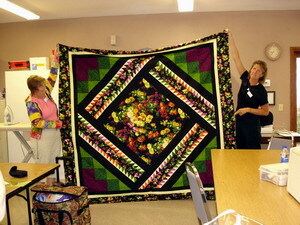 This is Janice and her quilt with Louise giving her a hand. 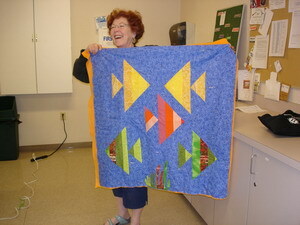 This is Sue and her quilt of fish. The fish need eyes yet. 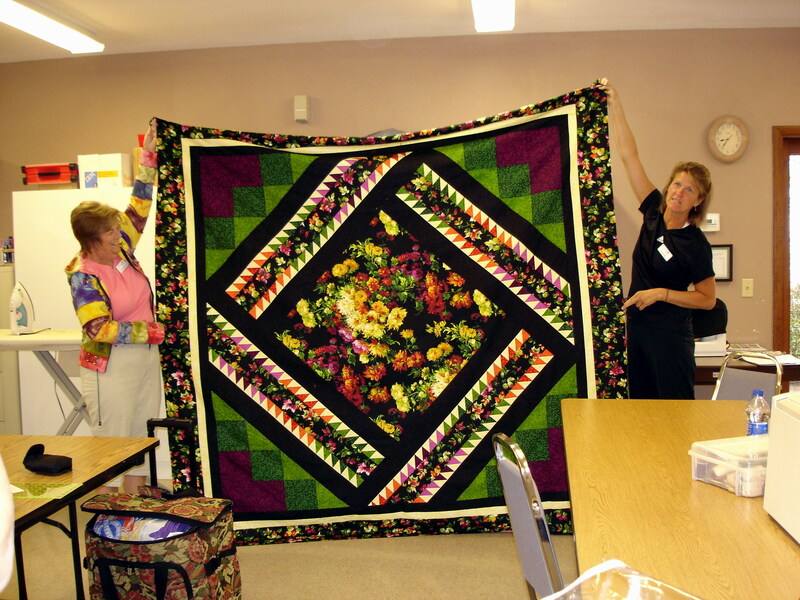 This is Joan with Josie's Jelly Roll quilt and Janice giving her a hand. Josie has her bedroom painted in those colours and it looks real good. This is Debbie with her quilt and Louise giving her a hand. Debbie's is another Jelly Roll and note the maple leaf stitching. This is Karen the Quilt Teacher. 12:52PM found W0BNW sending his call sign so there must be a contest of some description on 14023 kilohertz. We did not hear him make contact with anyone. He may be warming up for the weekend! At 1:30PM it was 68.0F and a clear sky. By 2:12PM it was 68.9F and a clear sky with Joan and Karen in the swimming pool. They were back shortly after 3PM and at 4:30PM the temperature was 70.5F and a clear sky still. There were the usual number of aircraft around. One high flying jet was leaving twin contrails. One from each engine. They were quite short but did not form into the one contrail like they usually do. At least this is the first time I have noticed that. At 6:15PM the sun was setting to a clear sky and the temperature was 66.3F. There was no real colour to the sunset. It simply faded into an orange yellowish green blue strip and then it went dark. When the evening movie ended, a rather lousy Canadian one, the temperature was 51.4F and the sky was clear. That was our day and another good one was history.